Instagram, the land of friendly pictures of kittens, puppies and fauna turned into the site of political brawling yesterday. 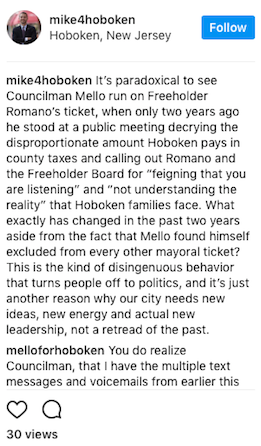 Councilman Dave Mello who was announced yesterday joining the Romano for Mayor council at-large slate had a few choice words on the Instagram account of Councilman Mike DeFusco yesterday. 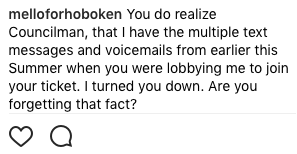 DeFusco included a short video where Councilman Dave Mello criticized Hudson County for the large tax increases on Hoboken. In recent years it's increased over 50% and is now the largest portion of the taxes Hoboken residents pay. He added a sidebar comment saying Mello "found himself excluded from every other mayoral ticket." Talking Ed Note: Well, there's the beginnings of another front opening up in the November election.